Experience the nomadic era of the Wild West as you ride the remnants of the Old Spanish Trail on the Spanish Trail Horseback Lunch Ride Coupon. After a short drive from your Las Vegas hotel, ranch hands will help you select a trusty steed for the excursion. These good-natured animals are perfect for everyone, regardless of previous riding experience. Once your horse is ready, you will climb into the saddle for an amazing journey across the colorful countryside carved by time, wind and rain. You will travel over some of the same land that settlers traversed in wagon trains as they headed west in search of a better life. The backcountry also served as a haven for bandits who tried to outrun the law. Stretching at one time from Santa Fe to the historic district in Los Angeles, the trail was a popular route in the mid-19th century. The scenic tour of Red Rock Canyon National Park and the Moapa Valley takes approximately one hour. During this excursion, you will see Joshua trees, roadrunners, jackrabbits and big horn sheep as you listen to experienced trail guides share interesting facts and stories. You will have ample opportunities for capturing the spectacular views on camera. When the journey is over, you will enjoy a hearty cowboy lunch that includes barbecue ribs, baked beans and dessert. Guests with dietary restrictions can make special meal requests. Before returning to the hotel, you can explore a cowboy town and meet the young animals in the ranch’s petting zoo. 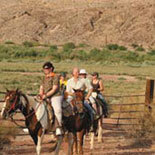 The Spanish Trail Horseback Lunch Ride will last approximately five hours. Children 12 and under must wear helmets, which are provided at no charge.